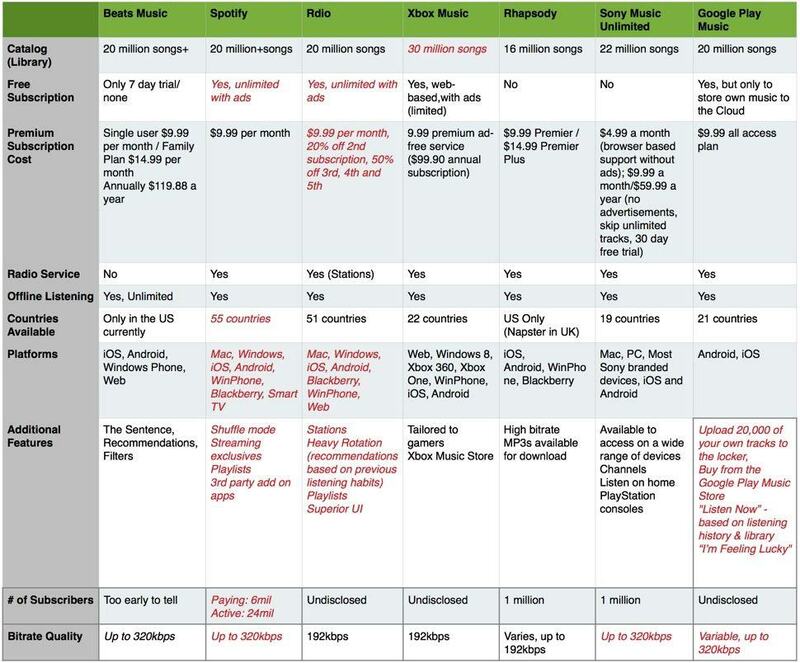 Comparing all on-demand streaming music options. It wasn’t too long ago when Spotify unlocked the ability to stream for free from mobile devices without paying for a subscription. Though you won’t get the full shebang, and it’s ad-supported with commercials, users can create playlists for free and play through them on a shuffle basis. The major drawback is the limit of only six skips per hour, which can be pretty restricting if you’re picky like myself. That said, it still means that if you’re a free subscriber you don’t have to commit to paying a single cent and can still enjoy the music you love on the go. Alternatively, if you’re an iPad user, the free ad-based version is flexible in that it allows you to play any song as much as you like. This could be a worthwhile compromise if you have an iPad and aren’t particularly fond of the shuffle mode aspect of the mobile version. For $10 a month though, the Premium subscription of the Spotify service is absolutely worth it, especially if you enjoy music on the go with no limitations. Not only are there no ads or commercials to contend with, but the audio quality is considerably higher, there’s the option to download tracks to your device for offline playback (handy if you’re on the subway a lot), and there are no skip limits as well as full access to the mobile apps. Overall, the premium version is far more superior than the free one. 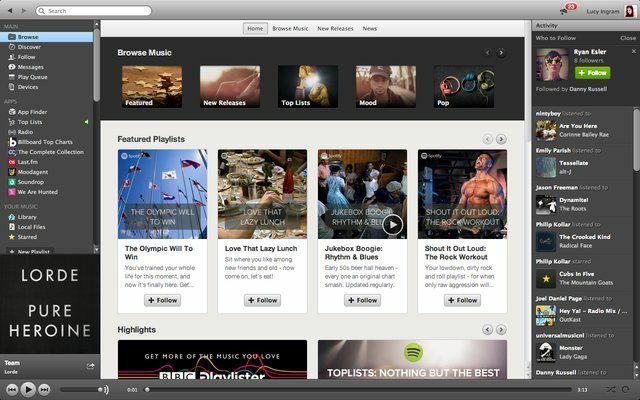 Also worth noting is Spotify’s huge catalog of music, which boasts a whopping 24 million tracks. Included within that number are Spotify exclusives, such as the recent addition of a whole backlog of Led Zeppelin albums, unavailable anywhere else as of yet. Furthermore, even if you’re not a mobile or tablet user, the desktop app is still available to listen to as much music as you like for free. Likewise, Spotify is very much a popular choice with Android’s Google Play users; the four and five star rated reviews collectively amounting to a higher total overall than the one to three star reviews combined. Most of the negative reviews relate to some of the stability issues, but this is mostly an Android-focused perspective, not of the service itself. Spotify doesn’t come without issues, however, but most of these grievances are linked to the free version more than anything else. The lack of a repeat button can be somewhat frustrating for those who like to listen to a track more than once but this is only a small inconvenience. If you have a paid subscription, there’s nothing stopping you from searching for the track again. The free version is fairly restrictive with its mandatory shuffle system and limitations on skipping, but it’s also one of the only services which allows free users to sync their favorite tracks and listen to their music offline for as long as they like. It’s worth mentioning that if you’re not a regular Spotify listener, (and this accounts for the Premium subscribers too), the playlists or songs that have been synced to play offline can from time to time need to be synced again, even if you’re not in offline mode. There’s no explanation for this bug, which continues in the updated version of the app, but it’s not a huge issue and is easily worked around. Another more apparent downside is the recent confirmation that Chromecast users will indeed be able to access more music services by way of Rdio and Beats Music, who have both announced they are working with Google to enable support. Unfortunately, there’s still no word on whether Spotify will be joining this bandwagon, which is a slight disappointment for those who favor Spotify over the other music services. More recently, within the last month, Spotify opened up a merchandizing feature to all artists across the UK and US, as well as in Ireland, Aus, NZ, Denmark, Sweden, Norway and Iceland. With plans to roll out this service elsewhere in the future, this could be yet another successful move for Spotify. With the ability for fans to buy any merchandise they wish from t-shirts and posters, to deluxe box-sets and vinyl, it remains without a doubt that Spotify will keep growing in popularity. For the perfect go-to app for all your listening music needs, Spotify still remains the number one choice. Catalog: More than 20 million songs available globally. Free streaming option: Yes! Unlimited with ads, in fact. Mobile platform offers shuffle option only. Cost for unlimited use: $9.99 per month for all-device access without ads. Spotify’s younger rival cuts it pretty close in terms of purpose and functionality, especially considering it hasn’t been around as long as its older, more superior cousin. Rdio’s smaller music library is just one reason that Spotify remains the popular choice, coming in at just over 20 million tracks compared to Spotify’s 24 million and counting. Catalog wise, there may be a couple of significant differences that give Rdio a slight edge; namely the broader range of diverse artists which in turn means Rdio may well be slightly more advanced in terms of music discovery. Rdio also has the advantage of being able to add music to a “collection,” rather than relying on a series of playlists. However, it’s heavy reliance on its integration with social media can be slightly off-putting, as it uses this method to be consistent with its recommendations. Another factor that plays its part is audio quality. Many music lovers will expect a certain quality when paying for a music streaming service, and Rdio’s measly 192kbps is a slight disappointment compared to the more acceptable 320kbps offered by other music streaming services. Desktop applications are also important when it comes to narrowing a decision down, and Rdio’s desktop app is a little diluted compared to the faster, more responsive desktop app offered by Spotify. Disappointingly, it doesn’t offer more than basic functionality, so there’s no definitive reason just yet to use this over the web player in your browser. Rdio may well be the lesser-known service, but its competitive prices can certainly overshadow most alternatives, which is also a reason that it comes in a close runner up. If you’re based in the US, there’s a huge 50% discount for those who sign up as a student or to the family plan. The discount also applies to web only listeners, who can stream from their computers at a reasonable price of $4.99. Free streaming option: Free and unlimited with ads. Cost for unlimited use: $9.99per month for all-device access without ads. Subscription base: Undisclosed, but Rdio says that 90 Percent of its subscribers are on its $9.99 unlimited streaming plan. The recently launched Beats Music has a lot of heart, but with so many other alternative and popular music subscription services, it’s hard to pinpoint exactly what it has to offer that the others don’t already. It’s unique user experience, playful interface and interesting approach to music discovery definitely offer something different, but at the same time is altogether a little too random in some respects. Upon launching the app, you’ll go through a get-to-know you sequence in which you’re able to pick a few genres and artists that are to your liking. It’s a great idea, but the choices are fairly lacking, and since it uses this information to recommend albums “Just For You” then it may not be as tailored to your tastes as you want. Another section for recommendations, “The Sentence”, presents you with a sentence in which you fill in the blanks selecting from a series of words. 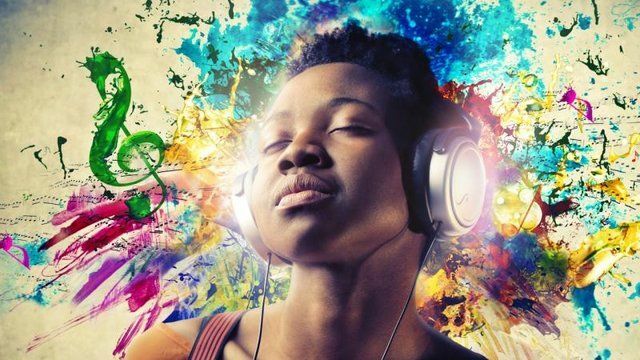 Although a playful and fun take on discovering new music, it can be a little hit-or-miss in terms of the outcomes it suggests. If you’re looking for personalization and curation, Beats Music certainly triumphs above all of the others in this respect, and its vibrant, sleek interface stands out beautifully amongst the crowd. That said, the lack of a desktop version and a limited number of platforms to experience Beats Music upon means it falls quite far behind in terms of usability. 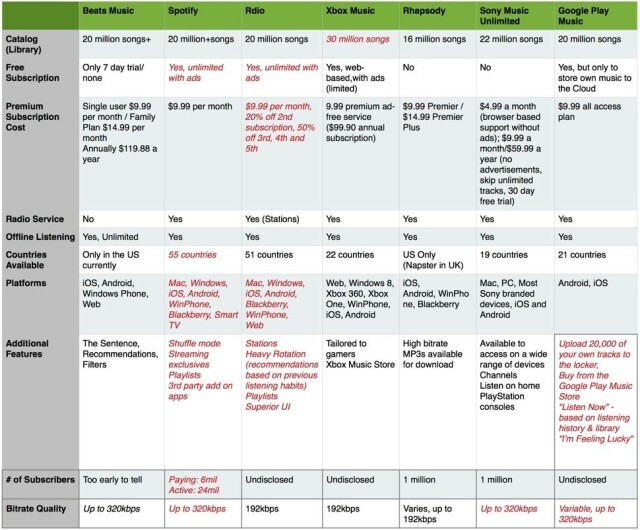 Add to this the fact that Beats Music hasn’t been around all that long, the lack of a free version, and that it’s currently only available in the US, and it’s obvious that Beats Music is the inferior choice as it stands currently. That’s not to say it doesn’t have its benefits though, and for those who love a truly personalized experience with its own series of characteristics, it’s definitely worth checking it out. Catalog: More than 20 million songs. Free streaming option: Seven-day trial. Cost for unlimited use: $9.99 per month or a five-person family plan through AT&T for $14.99 a month. Subscription base: Too early to tell. Beats are hoping MOG subscribers will transfer to their service when the MOG service closes down (April 15th). 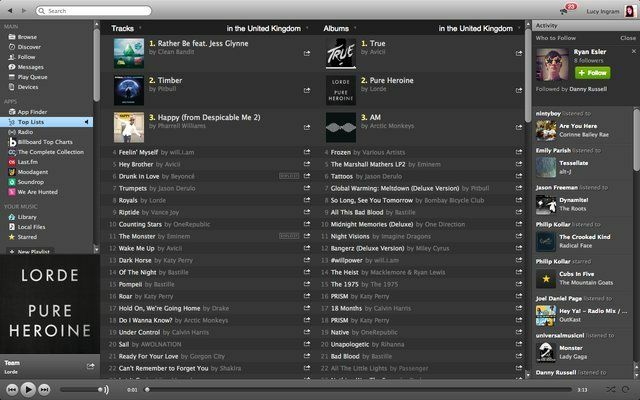 Spotify: International availability, all round best user experience, best audio quality, biggest song catalog. 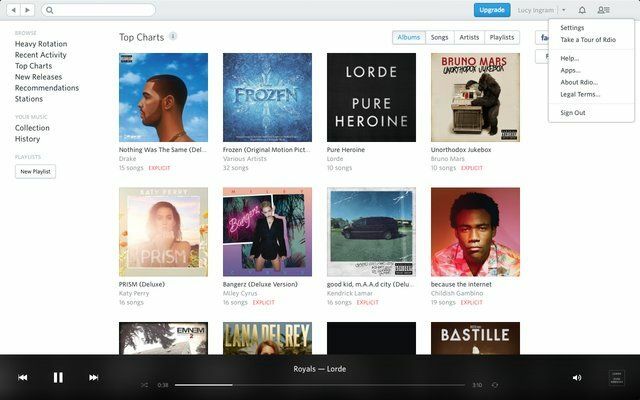 Rdio: More exclusive rights with certain artists, sound quality isn’t the best. 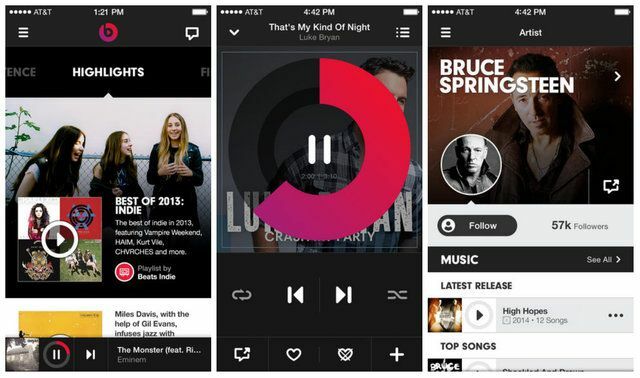 Beats Music: Best for playlist and music discovery, great sound quality. Ultimately the final decision is down to personal choice and circumstance, but each of the above music services all have their own free trials (though Beats Music limits its trial to seven days). For usability and the biggest music catalog, Spotify is your best bet, but if you’re personally not fussed about audio quality and like discovering a whole range of artists, Rdio may well be the one for you. Unfortunately it’s early to say whether Beats Music is in line for the throne considering how new a service it is but it definitely wins in terms of creativity. Obviously the best plan of action is to trial each one for a significant amount of time and see if it manages to meet your needs, but if the services above don’t tickle your fancy, then there are a couple of alternatives that just about made it into our top five.